During these difficult economic times, schools are feeling the budget pinch as much as any other group. 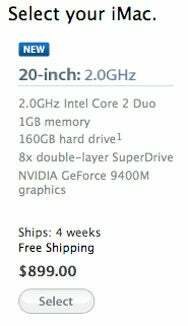 So Apple's decision to begin selling a 2.0GHz 20-inch iMac to educational institutions (PDF link) for $899 couldn't come at a better time. The 20-inch model replaces the 17-inch polycarbonate iMac for education, which Apple was found to be still selling only a few weeks ago. The iMac includes the same 1,066MHz system bus as the current consumer models, 1GB of DDR3 RAM, a 160GB SATA hard drive, 802.11n wireless networking, a gigabit Ethernet port, four USB 2.0 ports, one FireWire 800 port, a slot-loading SuperDrive, and Nvidia GeForce 9400M graphics processing. The model is only available to educational institutions, not for individual students or faculty. For everyone else, the entry-level iMac is a 2.66GHz 20-inch model with 2GB of RAM and a 320GB hard drive—it runs $1,149 for students, or $1,199 for the general public. The new education model will be available in four weeks.